Head and shoulders portrait of Brook Taylor in a painted oval, wearing a shoulder-length grey wig. Taylor is dressed in a light brown coat with prominent buttons, opened to show a yellow silk waistcoat brocaded in a floral design with silver and dark green, also open, and a white shirt and cravat. Artist unknown, possibly by studio of Hans Hysing (1678-1752 or 1753). 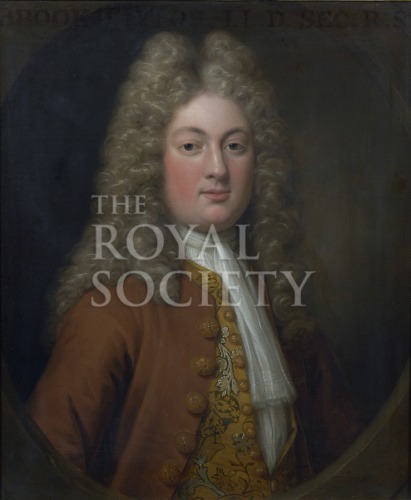 Taylor was elected a Fellow of the Royal Society in 1712. Presented by Sir William Young FRS, 1807. This work was in the possession of the Young family before being presented to the Royal Society. A mezzotint version was published in 1793, inscribed “From an original Picture in the possession of Lady Young”. [The print was by the engraver Richard Earlam (1743-1822) see for example, NPG D6930]. Brook Taylor’s only child, Elizabeth (1729-1801) married Sir William Young (1724/5-1788) first baronet and the painting must have belonged to her. The gift was made by her son, the second baronet Sir William Young FRS (1749-1815). According to the entry in the Society’s Journal Book: “A portrait of the late Brook Taylor M.D. Sec.R.S. painted by Ramsay & original letters of Dr Brook Taylor [now Royal Society MS/82] both presented by Sir William Young Bart., F.R.S.” [Royal Society Journal Book Original JBO/39, meeting of 15 January 1807, pp.241-242]. Ramsay must be intended to mean the Scottish painter Allan Ramsay (1713-1784) who trained in London under Hans Hysing (1678-1752 or 1753) in 1732. Given Brook Taylor’s death in 1731 Ramsay’s involvement would be impossible, but the name may commemorate a link with Hysing and his studio, a more likely attribution for the work.